This Day in History: July 20th- First! The first baby born in the Americas to those who traveled over on the Mayflower was the second child of William and Susanna White, who are thought to have been part of a London merchant group, rather than the Leiden Holland religious movement. The couple boarded the Mayflower in England with their young son Resolved. They named their second son Peregrine, which means “one who journeys to foreign lands” or, more succinctly, “pilgrim.” Fitting, considering he was born while the ship was at anchor in Provincetown Harbor in late November of 1620. During that first winter in the New World, William White, like so many others of this group, died. Just three months later on May 12, 1621, Susanna married another Mayflower passenger named Edward Winslow. The couple went on to have two children of their own and the family of six settled in Marshfield, MA, just north of Plymouth. Peregrine did very well for himself throughout his life. He was a member of the militia as a lieutenant and then as a captain. He served as a representative to the community’s general court and, like most settlers, he was also a farmer. He enjoyed minor celebrity status for being the first of his community born in the region, but it didn’t spare him from being brought before the local judge for “fornication before marriage” with his bride-to-be Sarah Basset. The randy young couple married in 1648 and eventually had seven children. They moved onto land owned by Sarah’s parents, who arrived in Plymouth on the Fortune in 1621. 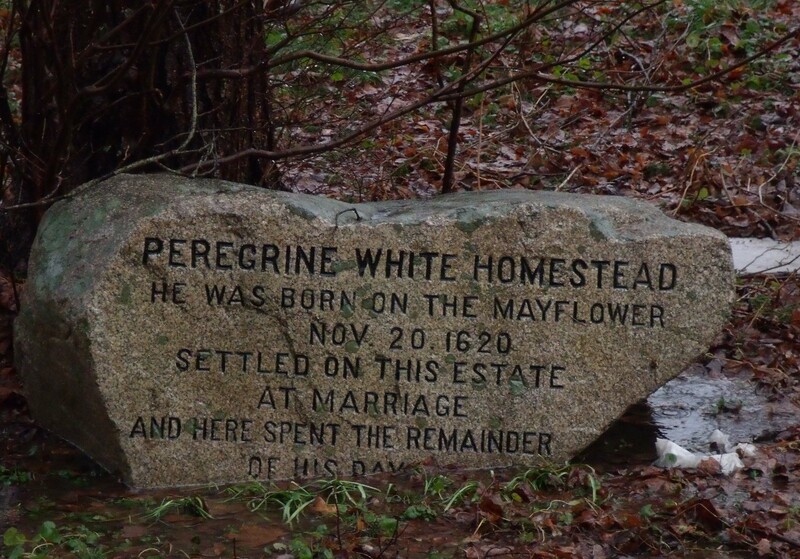 Peregrine was eventually given 40 acres of his own to farm, then granted even more in 1655 for being “first of the English that was borne in these ptes.” Then a couple decades later he was granted another 100 acres, making him relatively well off for his time. He died on July 20, 1704 at the age of 83. Marshfield, July, 22 Capt. 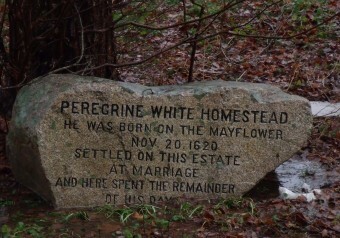 Peregrine White of this Town, Aged Eighty three years, and Eight Months; died the 20th Instant. He was vigorous and of a comly Aspect to the last; Was the Son of Mr. William White and Susanna his Wife; born on board the Mayflower, Capt. Jones Commander, in Cape Cod Harbour, November, 1620. Was the First Englishman born in New-England. Altho’ he was in the former part of his Life extravagant; yet was much Reform’d in his last years; and died hopefully. The honor of the first known English baby born in the New World goes to Virginia Dare of the Roanoke Colony, who was born on August 18, 1587. No. She was no more than the second and probably the third or fourth. History does not start and stop with Massachusetts, much as they might like to think. @Hildy J: Thanks for the info. We really appreciate it as we absolutely loath factual errors in our articles. 🙂 Fixed! Did you never hear of Virginia Dare? Dare was born in Virginia in 1587 of English parents. By my oh so rough calculations that is 117 freaking years before the date you give for Peregrine’s birth. Today I Found Out I can’t believe anything I read in “Today I Found Out”. I also find it unlikely that no child of English parentage was born in the intervening ONE HUNDRED SEVENTEEN YEARS! @George Hanes: If you are looking for 100% accuracy in any source, there is no such thing, not by a long shot. As we say in our About page: “we’ve personally encountered numerous errors in some of the best, and most accurate sources for information, such as the OED, Encyclopedia Britannica, Snopes, the Oxford Dictionary of Quotations, the QI books (and show), Uncle John’s Bathroom Reader, The Straight Dope, Mental Floss, the Barnhart Concise Dictionary of Etymology, etc. etc. Again, nobody bats a thousand, but like these aforementioned institutions, we try exceptionally hard to make sure everything posted here is perfectly accurate given the current state of human knowledge when the article was published.” The problem of course is that when many otherwise reputable sources we consult get it wrong, there is always the chance we will too, as in this case. For reference, Encyclopedia Britannica itself, one of the best general knowledge compilations created in human history has approximately 2.92 errors per science article on their website. TIFO has a drastically better rate than that on the whole, but of course we don’t cover near the depth or breadth of works as they do, so it’s easier for us. Britannica’s rate is really quite remarkable given the vastness of their work. In the end, the dividing line really becomes those who put in the effort for perfect accuracy and those who don’t. Both camps will be wrong sometimes, but the former will be wrong a whole lot less. It should also be noted that you shouldn’t fall into the logical fallacy that “Some things in Encyclopedia Britannica are wrong, therefore all things in Encyclopedia Britannica are probably wrong.” If we were to adhere to that line of thinking, we would assume you were incorrect about Virgina Dare, as you incorrectly stated we said that Peregrine White was born in 1704, which is incorrect. What we actually said was, “he was born while the ship was at anchor in Provincetown Harbor in late November of 1620.”- so only a roughly 33 year gap. Similarly, if one scientific study is shown to later be incorrect in some way in its conclusion, we shouldn’t then assume that all scientific studies, even necessarily done by the same researchers, are incorrect in their conclusions. What we should always be, though, is skeptical. In any event, thanks for enlightening us about Virginia Dare. We had not heard of her and will fix the article accordingly. @Daven Hiskey – As you point out, history is not an exact science. Besides, without errors, what would we critics have to criticize? To paraphrase Stephen Decatur (or maybe Carl Schurz – there goes that messy history again) “my todayifoundout, right or wrong. @George Hanes – Math, on the other hand, is an exact science and 1620-1587=33, not 117, however rough the calculation. And, while 33 years off is bad, it should be noted that Roanoke vanished soon after Virginia Dare’s birth and for the next 20 years there were no English settlements in the New World until Jamestown. @New Englanders – for Colonial, Revolutionary, and National history, start with Virginia. Heck, Jamestown even had the first Thanksgiving feast in 1610, a decade before the Pilgrims showed up.